Ireland's golden couple Amy Huberman and Brian O'Driscoll welcomed their son Billy O'Driscoll into the world yesterday afternoon. Amy gave birth in the National Maternity Hospital, Holles Street where the couple's one-year-old daughter, Sadie, was also born. The choice of Christian name means newborn Billy will share his father's iconic initials - 'BOD'. Bookmakers Paddy Power have already placed odds of 100-1 that Billy O'Driscoll will play for Ireland. Rugby fans were quick to wish the couple well, dubbing Billy 'BOD II'. Lord Mayor of Dublin Christy Burke congratulated the "Freeman of Dublin" - a reference to Brian's conferral earlier this year. The IRFU also tweeted their congratulations, asking: "Will there be another BOD for Irish Rugby one day?" Amy (35) and Brian (35) only announced they were expecting their second child just over two months ago, on September 9. Speaking at the time, Amy said she was pleased the couple had "managed to keep it under wraps for so long". "We thought we'd just get on with it." Asked if they were hoping for a son Amy said: "Either way it's good, if we have a sister for Sadie or a little boy we'll be happy." 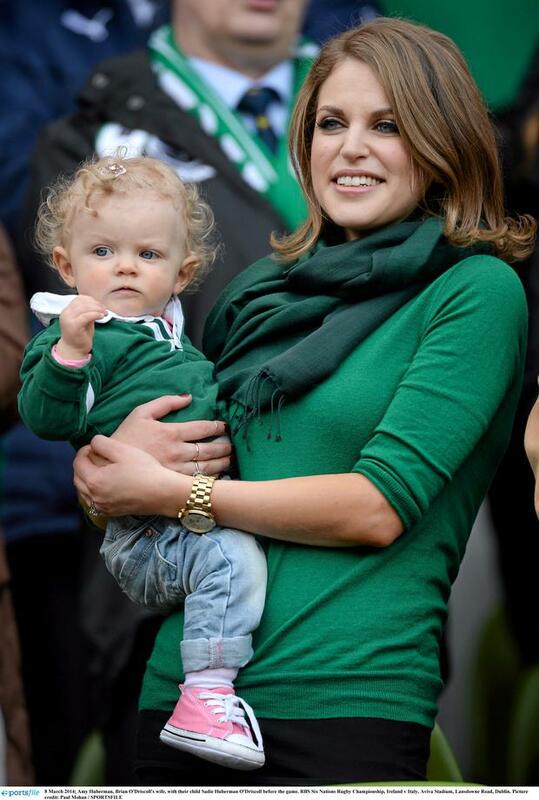 Sadie O'Driscoll was born on February 10, 2013, just hours after Amy had walked the red carpet at the annual Irish Film and Television Awards and before Brian took to the pitch for Ireland's much anticipated Six Nations clash against England. Brian later admitted that he found it difficult to concentrate during the critical match. "I don't even remember a lot of the game and I was in my own world for most of the time," he said. "This most wonderful thing had happened. Everything else paled into insignificance." Amy and Brian celebrated their fourth wedding anniversary in July. He retired from rugby earlier this year.